In a world of endless choices, determining what to eat and when to eat it can seem overwhelming. Fortunately, it doesn’t have to be this way. 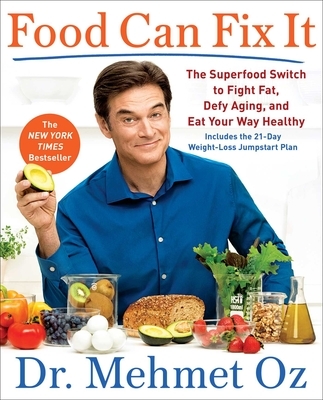 In Food Can Fix It, Dr. Oz lays out a simple, easy-to-follow blueprint for harnessing the healing power of food. Through simple modifications and a meal plan filled with nutrient-rich superfoods, Dr. Oz explains how to kickstart weight loss, improve your energy, decrease inflammation, and prevent or alleviate a host of other common conditions—all without medication. His plan also includes stress-free, healthy, and delicious recipes and appealing full-color photographs that show just how easy it can be to improve your well-being through the food you eat. Drawing on responses from thousands of readers of The Good Life, Dr. Oz's popular, prize-winning magazine, Food Can Fix It is the ultimate guide to eating for health, and the ticket to living your best life, starting today.